The main feature of the ProForm Perspective 1000 elliptical is the cable-ready flat screen TV built right into the console to keep you entertained during your workout sessions. Now you’ll never have to miss the news or your favorite show and the half hour spent on the trainer will fly by. The 7-inch display on the console functions as a TV, but you can quickly switch over to see an onscreen readout of your workout stats. For programming, the ProForm Perspective 1000 offers 20 Personal Trainer workouts, 2 Heart Rate workouts and 2 Learn workouts you can create and save yourself. A pre-installed program leads you through challenging fat burning exercises while it automatically adjusts the elliptical trainer’s resistance. The Target Pacer indicator on the display lets you know when it’s time to work a little harder, or slow down, either signal is a plus when you’re working in the manual mode. UPDATE: The Perspective 1000 is an older model and is no longer being sold. You can check out all of the latest ProForm elliptical trainers here. While there are some cheap parts used in the ProForm Perspective 1000 (to keep the price down), experts and trainers feel that the overall value of this front drive machine makes it a good buy. The Silent Magnetic Resistance gives you a smooth and frictionless ride, and the 18" stride is an ideal length for most users. 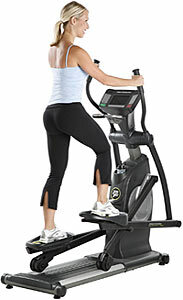 Consumers writing their own ProForm elliptical reviews feel the unit offers a comfortable and reliable workout. The Perspective 1000 comes with everything you could hope for on an elliptical, similar to what you find on the club models at your gym. The 18" stride and reverse motion, combined with the wide pedals, are comfortable enough without putting strain on your hips and joints. The base is solid so there’s no jiggle or jolting to affect the console or the TV screen. Overall, customers are satisfied with their purchase of this model. There’s no question that this is a solid performing machine for the price. At $1299, the Proform Perspective 1000 elliptical is a good looking unit that provides decent value in terms of ergonomics, reliability, quality, design, noise level and stability. The warranties on Proform elliptical trainers are short so do think about buying a 1 or 2-year extended warranty. With free shipping included in the price, the extended warranty is actually very affordable.